Carrboro is a town of 20,000 and is directly adjacent to Chapel Hill. Many University of North Carolina at Chapel Hill (UNC-Chapel Hill) students, faculty, and staff live in Carrboro and travel to the university by bike, transit, or on foot. The town has the highest bicycle mode share in the state at approximately 4 percent and is, to date, the only League of American Bicyclists Bike-Friendly Community in North Carolina with a silver designation. These accolades demonstrate Carrboro’s commitment to the safety and accessibility of nonmotorized transportation. Regardless, the town acknowledges that ensuring bicycle and pedestrian safety continues to be a challenge. The Carrboro Planning Department works closely with several partners to implement the Watch for Me NC program. 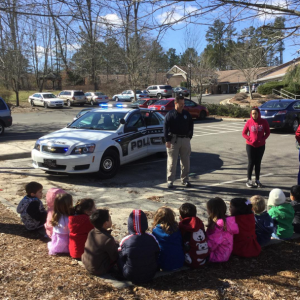 The Carrboro Police Department is very active in implementing the program through enforcement and education activities. Other partners include local nonprofits such as the Carrboro Bicycle Coalition and the ReCYCLEry. These partners contribute volunteers to events and incorporate Watch for Me NC materials in their independent initiatives. Since the program first began as a pilot project, the Town of Carrboro has been actively engaged with Watch for Me NC in a variety of ways. The Carrboro Police Department hosts a handful of events, such as Coffee with a Cop, Neighborhood Night Out, and Pizza with the Police, where Watch for Me NC materials are on hand and officers engage with the community in discussions about pedestrian and bicycle safety issues. The police department also hosts multiple Neighborhood Forums, a Citizen’s Police Academy, and provides Watch for Me NC resources to the local branch of Safe Kids, which uses the materials when interacting with schools, parents, and injury prevention groups. Carrboro uses its website and social media, such as Facebook, to conduct outreach about events and share safe road behavior practices. Carrboro’s social media messaging often includes #WatchforMeNC, which helps highlight the connection between singular enforcement operations and the statewide Watch for Me NC program. Additional outreach initiatives include distributing materials at special events, crossing guard training sessions, and several targeted bike light giveaways where bike lights are distributed and installed in lieu of citations for violation of the state statute requiring lighting equipment when bicycling at night. The Carrboro Bicycle Coalition has also worked to distribute bike lights through their Lighten Up campaign. The Carrboro Police Department now has a bicycle unit, which regularly attend local rides including the biannual ride with the Mayor. As part of the Watch for Me NC program, Carrboro typically conducts about a dozen enforcement operations annually. Carrboro focuses its enforcement and education efforts on all road users through crosswalk yielding enforcement and outreach to bicyclists about the importance of riding with lights at night. The key to Carrboro’s success with Watch for Me NC is the institutionalization of enforcement. Since 2009, the town has conducted enforcement regularly each month, year-round, and has been involved in community outreach and engagement. This consistent enforcement holds drivers, bicyclists, and pedestrians accountable for their behavior on a regular basis, and integrates safe road use as the cultural norm. Since launching the Watch for Me NC program, Carrboro has also improved its municipal ordinances related to bicycling. In 2014, amendments to the Town Code endorsed by bicycling advocates were passed that relate to riding abreast and rider spacing on roadways. In addition to enforcement actions, Carrboro uses the Watch for Me NC program to identify safe cycling behavior and acknowledge good behavior. For example, bicyclists riding safely have received “good cyclist vouchers” to a local ice cream shop. The Carrboro Police Department conducts enforcement activities at several different sites and rotates locations. The diversity of sites helps raise awareness about safe driving and nonmotorized behavior across the entire community and avoids the criticism that specific places are targeted excessively. Thank you to Sergeant Billy Austin with the Carrboro Police Department, Tina Moon with the Carrboro Planning Department, and Bergen Watterson formerly with the Carrboro Planning Department for providing leadership, time, and expertise that contributed to the Watch for Me NC Campaign in Carrboro and the information in this profile.